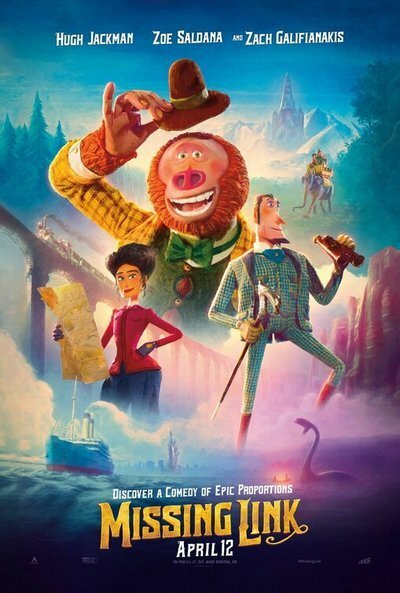 "Missing Link," a 19th century buddy picture starring an English explorer and Bigfoot, is the fifth feature from Laika, an animation studio that's as much a creature of its proper time period as the film's eight-foot-tall ape-man. Laika, who also made "Coraline," "ParaNorman," and "Kubo and the Two Strings," specialize in visually spectacular but psychologically intimate tales that are created with actual materials rather than computer pixels. Hugh Jackman voices the hero, Sir Lionel Frost, who travels the world documenting myths and monsters. The film contrasts Lionel with the culture of his time, which made folk heroes of wealthy men who traveled to Africa and Asia to kill animals with guns and show off their stuffed remains. But just because Lionel is more eco-friendly than other men of his time doesn't mean he's nice. He's the first adult hero of a Laika film, and although Jackman makes him appealing, he's bad news on paper—a man-child loner with no attachments who uses others for money and favors, and is long overdue to mature.